Cat DNA testing has gained popularity in the last few years due to the sheer amount of useful information it can provide to cat owners, professional breeders, and vet clinics. Since feline ancestry DNA testing is still a novelty, this guide will focus on the achievements of genetic profiling in cat health care. Our list of the best cat DNA tests offers a healthy mix of different solutions designed to keep your pets healthy and happy and make sure their life and health spans synchronize as much as possible. This guide is regularly updated in order to keep you informed about all the latest testing solutions, promising companies, good offers, and generous discounts. Here are the best cat DNA tests currently available. The companies on this list are ranked based on their cat DNA tests. The ranking is not indicative of the quality of the other DNA testing services offered by these companies. HomeDNA is a business branch of DDC, the most hi-tech DNA testing provider in the world. The company recently added a comprehensive and reliable feline test to its portfolio. With more than 35 offices scattered around the globe, EasyDNA offers high-quality feline PKD genetic testing in almost any corner of the world. The test is designed primarily for breeders but can also be used by private owners and veterinarians. DDC Veterinary is the animal-centered branch of DDC, the most modern DNA testing conglomerate on the planet. It offers a reliable PKD test designed to detect the disease before it even manifests. 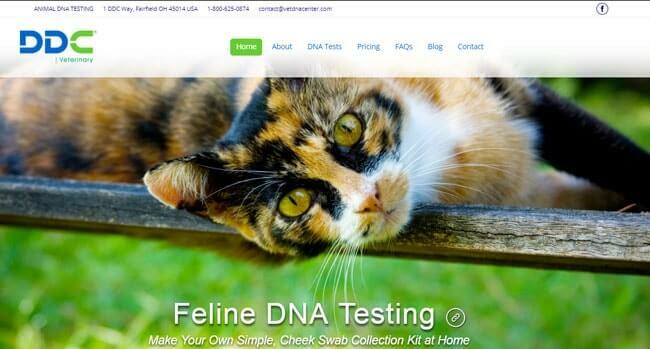 Basepaws is a young company dedicated to unlocking all the secrets hidden in feline DNA. It helps its users learn more about their pets and uses the data to make life better for all the cats in the world. Implementing an e-commerce approach to DNA testing, Live Well Testing features numerous health and wellness testing solutions for your feline friend. In order to objectively rank the companies featured on our list, we used a number of criteria that allowed us to assess each company based on those qualities we believe every good cat DNA testing company should have. We have conducted a thorough analysis of the tests, focusing on test diversity, quality, and accuracy, as well as staff competency and the quality of the testing facility and equipment. We further compared the tests with respect to the number of checked genetic diseases, breeds, and physical traits. In order to ensure that the cat DNA testing providers on our list are able to provide superb customer experience, we examined the average turnaround times, the quality of user support, the privacy and security measures taken, and the price-to-value ratio. Below are the detailed reviews of the companies that met all of the aforementioned requirements. HomeDNA is a branch of DNA Diagnostics Center (DDC) focused on forensic research, biological relationships, pets, and health & beauty. 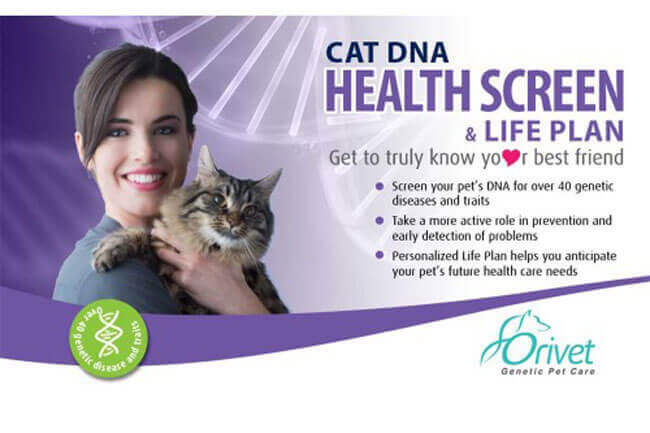 The company recently introduced Orivet’s Cat DNA Health Screen and Life Plan with a price tag of 125.00$. The test follows the usual direct-to-customer business model and allows you to screen your cat for more than 40 genetic diseases and traits. The final report is generated within 3 weeks and you’ll receive a direct email form Orivet informing you about your results. The results will allow you to actively participate in all health & wellness decisions concerning your cat and you can even share them with your vet, who can use them as an additional resource for well-balanced health care decisions. The test also provides you with an additional feature called “Life Plan,” which enables you to map out your cat’s health care more effectively. Note that you won’t receive the test results on your HomeDNA personal online account but through Orivet.com. This also goes for your cat’s Life Plan. If you have any questions regarding the service or the testing procedure itself, you can contact HomeDNA user support and its highly knowledgeable staff will solve all your problems. On the other hand, if you have questions regarding your results or the Life Plan, you should contact Orivet. EasyDNA is an international company in every sense of the word, featuring more than 35+ branches all over the world. It was launched in 2006 and has performed more than 300,000 tests since, always striving to hit that fine balance between high-quality services and optimal user satisfaction. The company follows the well-established direct-to-customer model, which means you’ll be able to do most of the testing process from the comfort of your home without making appointments with your vet or spending countless hours in waiting rooms. EasyDNA offers one of the best feline PKD tests on the market, allowing you to detect this debilitating and life-threatening disease and take appropriate actions ahead of time. The price of the tests starts at 60.00$ and its usual turnaround time is 10 business days from the moment your cat’s sample arrive at the lab. PKD or Polycystic Kidney Disease is a very crippling disease that can have a fatal outcome if not detected on time and treated properly. The condition is prevalent in Exotic Shorthairs and Persian cats. In order to eradicate PKD from your litter, you can test all your cats and exclude PKD gene carriers from mating. On the other hand, if you are thinking about buying or adopting a cat, a PKD disease DNA test is a must to determine whether your future pet carries this genetic mutation. DDC Veterinary is the animal-centric branch of DNA Diagnostics Center dedicated to canine, feline, avian, and even equine DNA testing. DDC is well-known as one of the (if not the) most modern DNA testing centers in the industry. It is the only company with robotic sample processing. DDC performs every test twice in order to completely remove any room for errors and potential mix-ups. Every report is inspected and approved by a Ph.D. and you can also schedule consultations in case there’s something you don’t understand about your results. 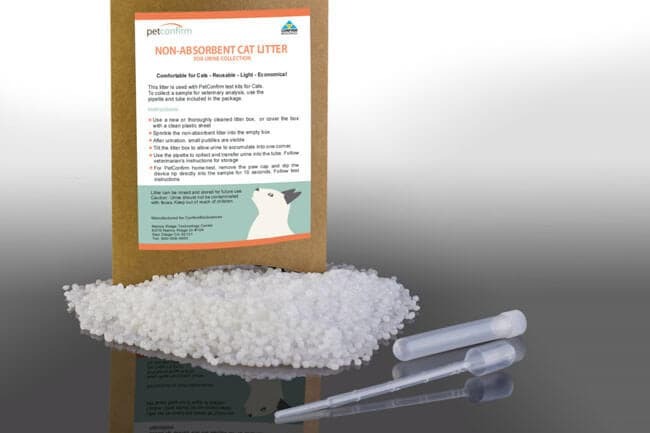 The company does implement the direct-to-customer model, but it also allows its clients to make their own feline sample collection kits. This is a great option if you don’t want to wait for the official DDC testing kit to arrive at your home address. The official website offers detailed instructions on how to fashion a DIY feline DNA collection kit. DDC also offers a PKD test to its users, giving them a fighting chance against this inherited disorder. The test costs 48.00$ per sample, with shipping costs charged extra. The average turnaround time is around 10 days after the lab receives your cat’s collected DNA sample. Basepaws is a pet genetics company founded in 2016 and headquartered in Redondo Beach, California. The company focuses exclusively on cat DNA and uncovering the secrets behind individual genes in the feline genome. Basepaws is a young company, so its test will receive many new and exciting features during the course of 2018/19. Its current Alpha Report gives you essential information regarding your cat’s breed and potential similarities with the DNA signatures of wild cats. The test covers 23 breeds and 16 wild cats, with many more to be added at a later date. The test itself costs 95.00$ and sequences 27 million selected nucleotides in your cat’s genome. This also includes DNA we currently know nothing about. Basepaws can also sequence your cat’s entire genome for 1,700$ or only the genes without the genetic packaging for 800$. It can test cellular tissues to help cats with cancer or other diseases as well (starting at 400$). Basepaws plans to implement additional reports in the future and will update your results free of charge throughout the lifespan of your cat. The average turnaround time at this point is between 2 and 6 months but should be cut to 4 weeks in the future. Live Well Testing is a branch of Confirm BioSciences, Inc. located in San Diego. The company implements an e-commerce approach and features numerous testing solutions covering everything from personal health and wellness to environmental and animal testing. Live Well Testing doesn’t offer feline DNA tests per se, but it has a lot of relevant testing options, securing its spot on our list. As we already mentioned, Live Well Testing is your traditional e-commerce website, which allows you to purchase numerous testing solutions for your cat and perform the tests at home. The company is actively working on implementing cat DNA tests, but they are still a novelty, as we remarked at the beginning of this ultimate guide. Apart from being a part of a reputable testing conglomerate and offering reliable and accurate tests, Live Well Testing also has an A+ rating with the BBB. The tests presented on our list met the entire set of our highly demanding criteria and even surpassed them in certain regards. The end result was a good balance between feline DNA tests focused on breed identification, health, traits, and carrier status for certain genetic diseases and conditions. In order to choose the best cat DNA test for your animal friends, you first need to identify your own needs and expectations. In other words, you need to determine what kind of results you are looking for. EasyDNA and DDC Veterinary will help you detect PKD in time to take adequate measures and protect your pet and litter from this deadly disease. HomeDNA is a perfect choice if you want to learn more about your cat’s genetic health predispositions and potential physical traits. Live Well Testing caters to cat owners who aren’t exactly sure about their next testing step but still want to monitor the overall health of their animal friends. Finally, Basepaws can help you learn more about your cat’s breed composition, including whether it has any wild relatives in its family tree. Our professional team compiled this comprehensive list of the top-ranked cat DNA tests to provide you with a versatile set of tools that can help you make the best choice for your pet, litter or patient. Once you have a clearer picture of your future testing actions, you can browse our dedicated reviews, interesting blogs, and detailed comparison charts for more information.